Our recently conducted Twitter Chat on, “Women safety and its impact on economic progress” was an insightful and constructive dialogue with 3 remarkable champions of women safety and women rights, Elsa Marie D’Silva, Founder and CEO Safecity, Sarika Bhattachharya, CEO, BD Foundation and Prerana, NGO rehabilitating victims of commercial sexual exploitation and human trafficking. The conversation began with a broad definition of the workplace to understand women safety in the workplace. The speakers and other participants in the discussion agreed beyond doubt that limiting the idea of a workplace to the four walls of an office cubicle would be unfair. As Elsa Marie tweeted, “Any place visited by an employee in the course of employment including transportation” must be considered as the workplace. The discussion went on to include virtual spaces as workplaces beyond the physical structures. The next discourse revolved around the relation between women safety and their joining, retention rates and promotions within the workforce. Everyone on the chat agreed that a positive correlation existed between the two. Women by law may have equal rights to work, but the fear of discrimination prevents the access of these equal rights. The question about women safety and their potential to climb up the leadership pipeline also had an unopposed agreement. It was agreed that safety reduces anxiety and improves self-esteem, morale and job satisfaction, which become the basis of promotions, among other factors. A safe workplace unleashes women’s potential to do great things and achieve big. 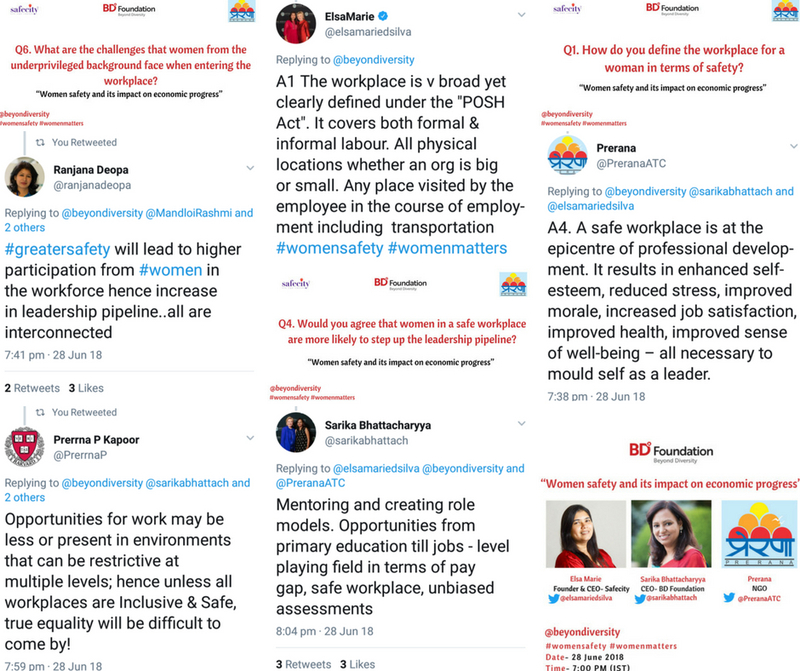 Collating the arguments about women safety and their participation in the workforce, Sarika Bhattacharyya mentioned that it is simple math, Safer workplaces ensure greater joinee rate and lower dropouts, providing a large talent pool for the senior leadership, hence more women climbing the leadership pipeline. The final segment of the discussion dealt with the contributions and impact of apps like Safecity in augmenting women safety at the workplace. It also explored with the challenges faced by women from the underprivileged backgrounds and the victims of commercial sexual exploitation when entering the formal workforce. Talking about the underprivileged women, the speakers asserted that they face multiple levels of restrictions and their struggles begin at birth in a patriarchy entrenched society. Further, as the speaker from Prerana tweeted, victims of commercial sexual exploitation tend to be the least secure, because they seem to have no rights, let alone the right to be safe. This engaging dialogue ended with some relevant insights which talked about removing the unconscious bias and stigma that prevails in our society about women. 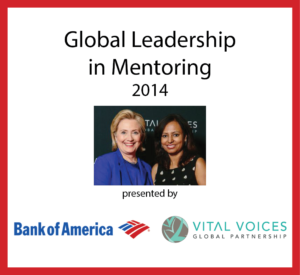 The need to mentor and create role models to ensure a level playing field for women was also highlighted. It was concluded that only a collaborative stand that sees women safety as a business case can ensure the safety of women. Invariably, women safety will initiate a cycle of greater participation in the workforce and subsequent greater productivity and economic gains.